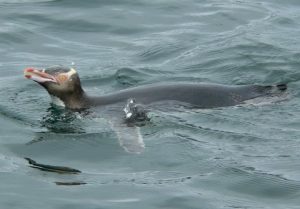 Adults typically forage up to 25 km offshore during the breeding season. When birds do not have to return regularly to feed hungry chicks they can travel much further, up to 60 km or more from shore. Hoiho dive to the seafloor to catch their prey and can do this as many as 200 times a day. Hoiho can dive to a maximum of about 150 metres, but more typically dives are 30-60 m.
Their favoured prey is small fish (up to 200 mm), including red cod, sprat, silverside, ahuru, blue cod and opalfish, as well as arrow squid. Chicks are fed a regurgitated soup of fish and squid by their parents.